In 1990 most of the Kashmiri Pandits left Kashmir as the emboldened terrorists had started their killings on a selective basis. One Shyam Kaul who was working as a public analyst (the one who tests food stuffs), did not leave, though he had already sent his family to Jammu. Maybe he was made of sterner stuff or maybe he was a little naïve or a little daft. The public labortary is situated at the base of Shankracharya Hill in Drugjan (historically known as Durgavanjni). A narrow road connects Dalgate to this labortary.This narrow road had become a den for gun-totting terrorists. Most of the time they would loiter in these lanes and bylanes which formed arterial ways to their hideouts.The place had an advantage that one could also hide behind the bushes in Shankracharya Hills. During this time one terrorist who was nicknamed as ‘Cobra’ quickly gained notoriety. He was dark and he could climb drain pipes and gun down his victims right in their bedrooms. By 1994, the time our episode took place he had become the most feared terrorist of Drugjan, Gojwara and Dalgate area. Those days government employees in Kashmir did not do any tangible work so Shyam Kaul too did nothing in his office. He would usually visit the office of the physician in governor's office and while away his time in idle gossip. He had a bad habit of bragging in his own office that he had close links with governor Saxena - a man who was anathema to the terrorists and their cohoots. One day as he was entering his office he was accosted by a ‘pheran’ clad bearded chap. A Klashinkov could easily be seen hidden beneath the pheran. Soon he was joined by another person. "You have been summoned by our leader Cobra Sahib", the bearded guy informed him. "I am a simple government employee, why should he ask for me," Shyam Kaul said. "He wants to check your antecedents," said the bearded man, holding him tight by his collar now. Soon the terrorists also entered and overpowered Shyam Kaul. By this time other staffers gathered near the door and looked on helplessly. One of the terrorists took out his revolver, pointed it at the temple bone of Shyam Kaul and was about to pull the trigger. But for Sula Bhat's timely intervened. The staffers seconded the solution and appealed. The militants agreed and now waited outside in the street. 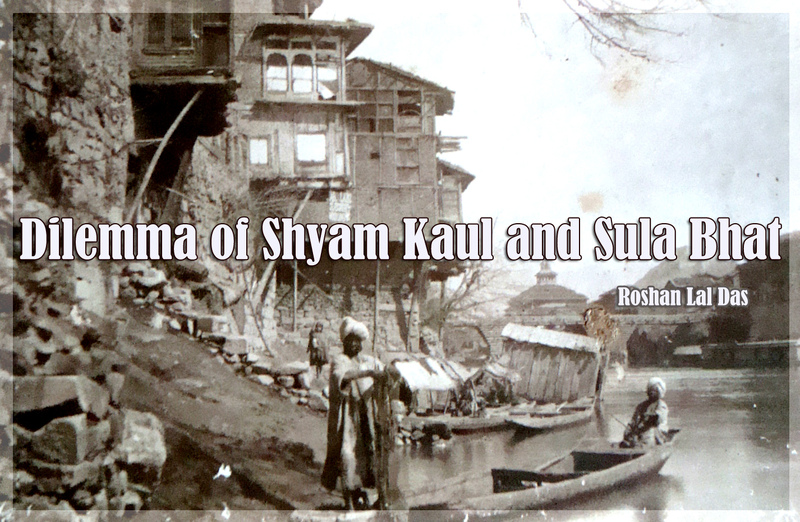 At about 4 P.M, Shyam Kaul accompanied by Sula Bhat came down the street towards Dalgate bus stand. They had hatched a plan. A bus was about to leave. Shyam Kaul ran fast and jumped into the bus which had speeded by then. The militants could not do anything as the bus was full of people. Shyam Kaul dropped down the bus near Badami Bagh cantonment. He went to the camp and narrated his sob story to the army people. They listened to him sympathetically. They asked him about all the details of militant hideouts in Dalgate and about the kind of ammunition these men had. They were surprised at the wealth of information he had. He stayed with them for the night and early next morning they sent him safely to Jammu. Sula Bhat had managed to free himself from the militant's wrangle by calling Shyam Kaul a wily fox and many other names. As soon as Shyam Kaul left, the army alongwith the local police swooped over whole of Dalgate area. They seized a lot of ammunition and arrested nearly a dozen militants including the two who had accosted Shyam Kaul. Cobra along with his mentor Bilal Lone escaped. Bilal Lone was one of the four most sought after terrorists of the valley. He escaped to Nepal. Cobra was later killed in an ambush. After two years in jail and lot of torture most of these arrested militants gave undertakings to the authorities that they will eschew violence and lead a peaceful life, if let off. Some of these men later joined counter insurgency group known as ‘Ikhwane-Musalmeen.’ As soon as the two militant,s from whom Shyam Kaul had escaped, were let off, they confronted Sula Bhat. Now Sula Bhat was in trouble. Three conditions were put forth before him: Either he should produce Shyam Kaul before them. Or he should procure two Kalashnkovs for them which was in replacement for the ones which had been seized from them.Or he should pay them Rs.4 Lakhs in lieu of the cost of two Kalashinkovs. Sula Bhat was given seven days to pick his option by the two men who seemed inclined to go into the new booming terror business as independent operators. Now Sula Bhat was in quandary. Calling the cops was more dangerous. What could he tell them? What could he expect? But there was one person who could may offer a way out. Dr. Rasool Raina, who lived earlier in Sula Bhat's neighborhood, had taken to militancy in his fifties. His son, who had been a fierce terrorist, had been killed in a shootout and after the son's death, his family was harassed by Security Agencies. Subsequently, Rasool Raina along with his family fled to POK. Dr. Raina was now conducting militancy related operations from POK. Somehow, Sula Bhat got in touch with him and requested for a reprieve. “Don’t worry, someone will come over to your house, he will hand you a two rupee note which will have a large hole in the center. If anyone tries to harm you, just show him the note, he will not dare touch you,” Dr. Raina assured him. Sure enough, a two rupee note with a hole in center made its way to Sula Bhat. That day onward he never came close to harm (except may one other time, more of that story, later).